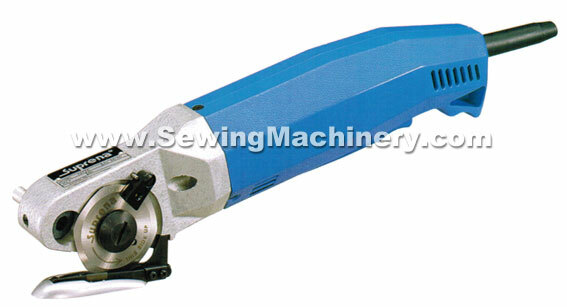 Small hand held cloth cutting machine with round knife blade and carbide tipped bottom blade for scissor like precision cutting. Stationary carbide counter blade for fine cutting. Built-in one touch automatic blade sharpener. Double insulated motor for electrical protection. Easy hand grip for better cutting manoeuvrability. Micro switch hand lever for easy operation. 230V 50Hz Fitted with standard 3 pin plug. Designed to help reduce operator fatigue and increase production when compared to hand use of large scissors & shears. Large stock of Suprena HC1015A spares & blades available from our parts dept. Air powered version also available.